We improve the lives of children throughout the world. Call about BIRTHDAY PARTIES, CLASSES, CAMPS – offering year round programs. Every day in My Gyms throughout the world, children have loads of fun as they develop physically, cognitively, and emotionally. Our programs focus on growth in all three categories because we view each step of development in these areas as an essential "building block" toward becoming a happy, healthy, well-adjusted human being. The Building Blocks program is designed to acknowledge My Gym Kids for their efforts and achievements. It is an interactive skill and development tracking and recognition system that provides specific opportunities for our students, teachers, and parents to enjoy and celebrate the attainment of key milestones together. My Gym locations worldwide offer perfectly planned celebrations, created specifically for each birthday child with special song and game requests made prior to the party. Our experienced and lively party specialists will design a unique and personal celebration for your child, jam-packed with exhilarating activities, games, puppets, songs, special rides and more! It will be an occasion long remembered, and we handle everything! We cater to your budget with our Premier, Deluxe, and Grand Celebration packages, and we are equipped to provide nonstop party fun for a wide range of group sizes. 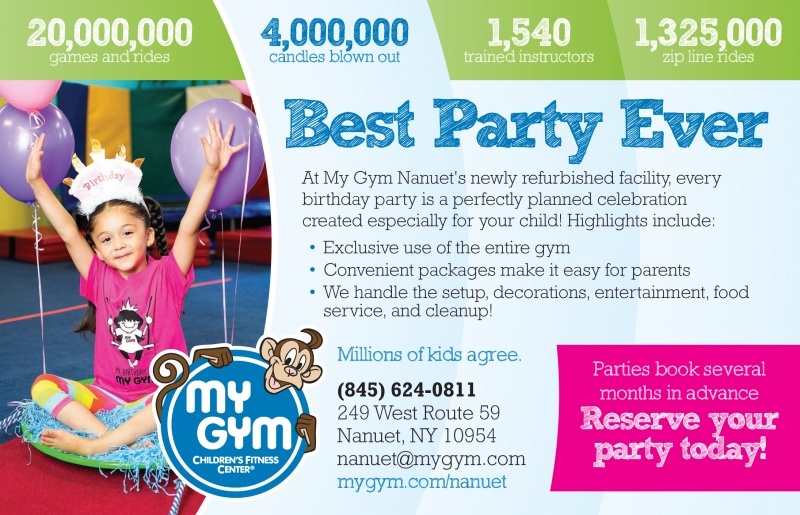 At My Gym Nanuet’s fully renovated facility, every birthday party is a perfectly planned celebration created especially for your child, with activity, music and game requests made prior to the party. Our entire facility will be dedicated solely to your family. Our amazing party specialists will make your birthday party unique and special. All of our parties feature nonstop action-packed activities, gymnastics, games, puppets, songs, and more! New themed packages make it easier than ever for parents to enjoy. We now offer Gaga and Sports themed parties.